Inspired By The Scrolling Design Of The Trump Family Crest, This Collection Creates A Rich And Regal Ambiance. The Solid Cast Iron Scrolls And Burnt Bronze Finish Compliments The Delicate Weathered Gold Leaf Accents And Caramel Amber Glass To Create A Dramatic And Stunning Collection. Charming and magical, with interlocking orbs reminiscent of the planets, the Infinity collection is a celebration of continuous motion. The clean lines of each oil-rubbed bronze ring entice the eye to travel the circle of orbs and globes intertwined. Arms reach up and out to hold gold-leaf rings that surround a taupe candlestick. Antique Bronze six-light chandelier provides a welcoming silhouette in any home. Unique translucent sheer Mylar shades encompass an inner glass globe. The rich, layering effect creates a dreamy look that is both elegant and modern. Offered as a complete collection, the Invite styling can be carried throughout your home or as a focal style in a special room. 6 Light Ceiling Mount Burnt Bronze Chandelier Inspired By The Scrolling Design Of The Trump Family Crest, This Collection Creates A Rich And Regal Ambiance. The Solid Cast Iron Scrolls And Burnt Bronze Finish Compliments The Delicate Weathered Gold Leaf Accents And Caramel Amber Glass To Create A Dramatic And Stunning Collection. 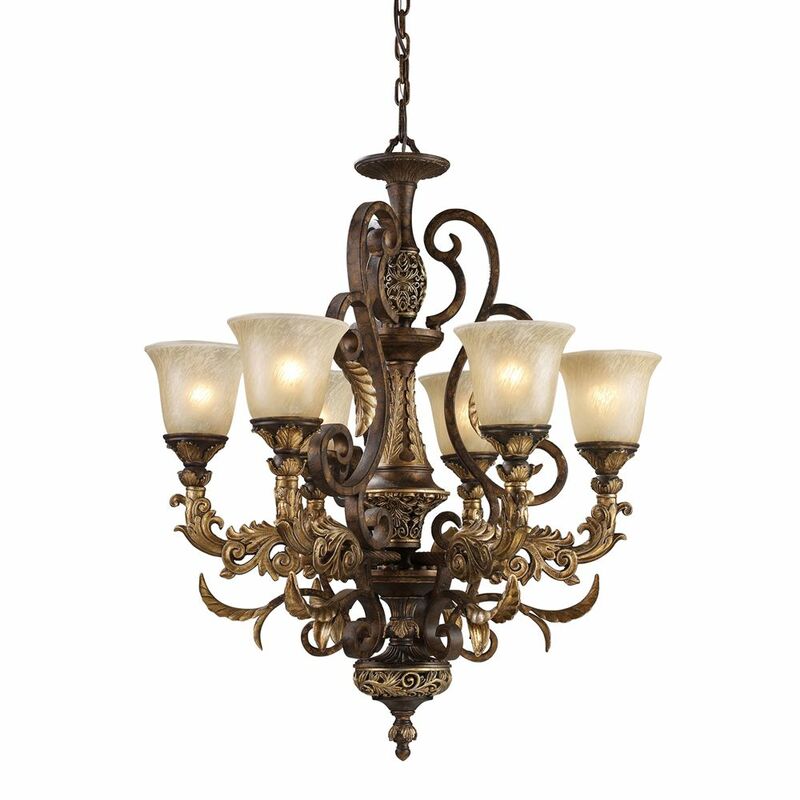 6 Light Ceiling Mount Burnt Bronze Chandelier is rated 5.0 out of 5 by 1. Rated 5 out of 5 by Marty from Beautiful traditional chandelier that accents the dining room. It's heavy duty with excellent wo... Beautiful traditional chandelier that accents the dining room. It's heavy duty with excellent workmanship. There is very little prep work. This must be installed using a ceiling joist and not hung coming off an electrical box. Worth the price and excellent investment. THANK YOU ELK LIGHTING!! !